Imagine that a scientist wanted to conduct an experiment to see if it’s true that blind hatred of President Trump has led Democrats and their media handmaidens to go ’round the bend and off the cliff. Such a scientist would inject a damning — and false — media report about Trump into the political bloodstream, then observe the reactions. It wouldn’t take long. The Gotcha! glee, the declarations of Trump’s certain impeachment for suborning perjury, reckless references to Richard Nixon, the breathless anticipation of resignation and disgrace, perhaps prison — these and other overheated reactions quickly clogged the airwaves and Internet, growing ever more bold as the day wore on and no compelling rebuttal appeared. Then, suddenly, the scientist pulled the plug on the experiment. He had seen enough to prove the thesis: Much of America, many of its leaders and some of its most prominent institutions are indeed gripped with madness. Hatred for the president has corrupted their judgments and blinded them to duty and decency. Having succumbed to prejudice and rage, they have proven themselves unworthy of public trust. Sometimes, life is stranger than fiction. Friday was such a day in America. It was a shameful spectacle. The BuzzFeed News report that special counsel Robert Mueller had corroborating evidence that Trump had instructed his former lawyer, Michael Cohen, to lie to Congress about a Moscow commercial project set the anti-Trump mob on fire. It was the bombshell development Dems and 90 percent of the media have dreamed of — and finally it was here. Oh, Happy Days! Except it wasn’t true. Mueller said so in an unprecedented debunking that slammed the brakes on the celebration. The site’s editor and others called the statement inadequate, but that was wishful thinking. The party was over because prosecutors denied the sensational central claim of the story, that they had gathered evidence beyond doubt that Trump had committed a crime. While BuzzFeed alone created the false report, which was based, naturally, on anonymous sources, it was not alone in revealing its desire to be rid of Trump. Much of the political class embraced the story without doubts because they wanted it to be true. Dems in Congress instantly pledged investigations. Not so long ago, no respected journalist or news organization would go public with something unless they had enough evidence to reach the conclusion it was true. The bigger the story, the higher the threshold of necessary evidence. Not Friday. Then the biggest possible story was presented with the least possible evidence. “If it’s true” is an admission of malpractice. To use it as a shield while reporting an accusation of massive significance violates every conceivable standard. Real journalists do not report something, then caution that it may not be true. You certainly don’t accuse the president, or anyone else, of a crime unless you are persuaded by evidence it is true. I have my doubts the media will do the necessary soul searching. As I have argued repeatedly since 2016, too many outlets are too invested in getting the scoop that brings down the president they love to hate. They have trashed their standards, and Friday was the inevitable result. But there is another possible silver lining emerging from the dark day, and I have more hope this one will make a difference. It is it a recognition that the endless Mueller probe has become a problem of its own making. It is not healthy that a prosecutor has become like a divine oracle, with the nation’s mood hanging on first his silence, then his statement. The Wizard of Mueller has no place in our democracy. Such power is too easily abused, and Mueller, whatever his personal and professional virtues, has gotten too big for America’s good. Fortunately, he will soon have a real and worthy boss. 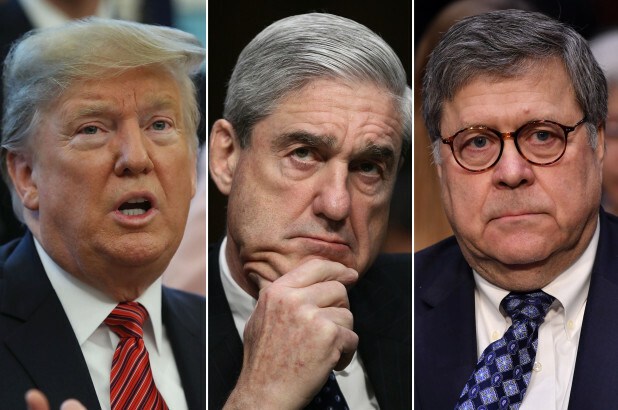 William Barr is almost certain to be the new attorney general, ending a reign of error that began with the hapless Jeff Sessions and continued with his deputy, Rod Rosenstein. Sessions’ recusal from the Russia probe because he was a prominent Trump campaign supporter is the bane of the Trump presidency. Rosenstein, for reasons known only to himself and perhaps Mueller, panicked when Trump fired James Comey, the corrupt FBI boss, and decided to appoint a special counsel. Yet Rosenstein wrote a memo justifying the Comey firing and participated in conversations about it, facts that gave him more conflicts than Sessions ever had. Equally troubling, Rosenstein, a career mid-level prosecutor, proved incapable of properly supervising Mueller, whose reputation and gravitas far exceeded that of his putative boss. As a result, Mueller has operated without restraint or guidance, with abuses and conflicts of interest on his team swept aside in what too often looks like a determination to knock off a duly elected president. Barr, I believe, will be the antidote to this destructive situation. He is, as I wrote last week, “a respected adult” who can tame the waters in the Justice Department and get to the bottom of the anti-Trump cabal that has robbed the FBI of its reputation for fair play. And he will not be a pushover for anyone. Barr, who was AG under the first President Bush, has a first-rate legal mind and a mature self-confidence born of experience, both of which he demonstrated at his confirmation hearings. The comments were widely interpreted as a warning to the president, and they were in some sense. But they were also a warning to anyone in Washington who would abuse power and corrupt key institutions for political purposes, whether in the media, Congress or the FBI. That includes the special counsel. Mueller is not exempt from the laws of common sense and fairness. When it comes to Trump, he must fish or cut bait. After nearly two years of investigating, on top of a 10-month FBI probe he inherited, Mueller needs to show his cards. The country cannot continue to thrash about with uncertainty over events that took place three years ago. The void is being filled with partisan trash and dangerous discord. As Friday proved, America needs clarity and finality, and it needs them now. of the articles I realized it's new to me. Anyways, I'm certainly happy I found it and I'll be bookmarking it and checking back often!